Beauty school dropout. That’s me … or should I say a failed mountain biker. I’ve been to a host of mountain bike camps and was NEVER brave enough to ride through a rock garden. I mastered one skill in mountain bike class: how to push a bike. But road riding …. that I loved. Except now that my little town of Bend is growing up, I am not that keen on riding in traffic. So GRAVEL cycling is just perfect for me. So perfect, my friends have nicknamed me “Gravel Girl”. Only I didn’t start out thinking that way … my husband bought us gravel bikes six years ago and I can say that bike sat in the garage for a few weeks until I was brave enough to even try it. It looked like a road bike, but I was supposed to ride it on gravel roads??? I thought it was yet another evil plan to turn me into a mountain biker. Little by little, I started riding bike paths … and then forest roads … I even learned how to ride off a curb and on easy mountain bike trails. Don’t worry, I still walk over all the rock gardens, now I can just pretend that IF I had a mountain bike I would glide over them. In the last six years, I have ridden a “zillion” miles on my gravel bike. I lead rides through our local Meetup group. And my husband and I have built a website called Dirty Freehub where we share our top gravel rides. So why oh why? I’m a chatty one …. I like riding next to people and hearing about their life stories. Gravel roads are wide enough for me to ride next to my pals and they are minus the cars. We can solve all the world’s problems in a few hour ride. Plus I like the woods, and mountain views, and riding through parks. I’m also lucky that I live in an area with loads of logging roads that are typically just perfect for me. 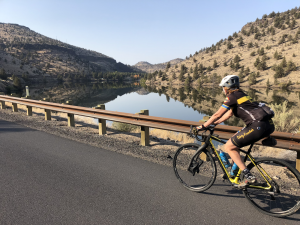 I can ride from the center of Bend out to both Benham and Tumalo Falls on gravel, then I use the paved roads to zip back to the house. I like all the variety. Now what’s tricky about gravel cycling? The biggest issue is navigation. I ride places that don’t have road signs or trail signs (typically). So I have had to learn to be really comfortable with my GPS. I carry a Garmin or a Wahoo device and I keep RidewGPS running on my phone, just in case. The other adjustment in gravel is tire pressure. I can’t tell you how many roadies show up with WAAAAAYY too much tire pressure. I ride with 20 pounds up front and 27 pounds in back and I weigh 135 pounds (on a 40 mm tire). It softens up the bumps I promise. And you really don’t lose speed. To really enjoy gravel, no matter what bike you choose, you need to change your mindset and think like a kid. 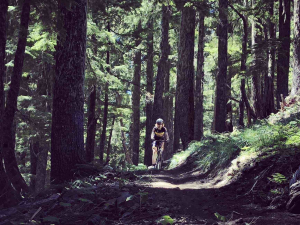 We ride on lots of surfaces: paved roads … bike paths … single track … double track … and gravel. The average speed all depends on the surface. I’m not afraid to hop on a sidewalk or ride off a shoulder. Anyhow, I am beyond excited about Cycle Oregon jumping into the gravel game. If you haven’t tried it, give it a go. You will see a whole host of bikes out there; it doesn’t have to be a born and bread gravel bike. I like my bike because we are good pals, it fits me really well, and my tires roll over just about everything. But I recommend you borrow different bikes and test them out. I ride with a few folks who ride hardtail mountain bikes (so they have some shocks but not front and back.). Typically they are happy dappy until we pop on smooth roads, then they are a smidge slower. We’ve had some folks ride road bikes with fatter tires and cross bikes too and they are a smidge slower on rougher roads. And even in the gravel bike world there are so many variations, it leaves us always with something to debate. If you are headed to my hometown of Bend, give me a shout. I’m always leading rides and you are welcome to join me. And I promise should we see anything that resembles a rock garden, I’ll be pushing my bike. Some things never change. I am not able to ride my bike on gravel or dirt any longer. Terrible balance. Given that though, Ilove to see your photos and and blogs. Keep it up Linda. Gary … you are an inspiration to us all. Thanks for the nice comments. Great description of the fun adventure of gravel riding, Linda. I look forward to seeing you at the Cycle Oregon Gravel Weekend. Great article Linda…and arguably the most I’ve ever heard you say about bike tech and gear….you’re evolving. And all kidding aside, the time and energy that you and Kevin put into creating, testing and leading rides is fantastic. 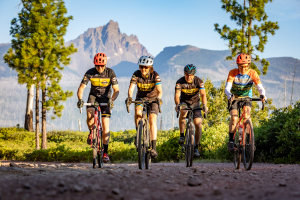 For folks that want to hear and learn more about the benefits and how-to of tubeless tires that Linda speaks of in this article come to our clinic “Toss Your Tubes” at Web Cyclery on April 17th. Thanks so much for your friendly invitation to gravel riding! 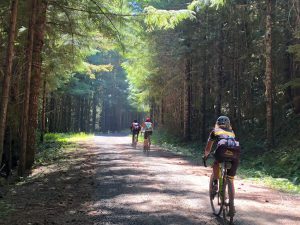 My gravel experience occurred on a ride led by someone who thought it would be authentic. I was on a regular road bike and thought it was authentically horrible. This is the first time I thought it might be worth exploring, perhaps with different tires/different tire pressure. Thanks again, might take you up on your invite some day.